This is the slogan that proudly faces passersby on MDC’s front window on Main Street in Durham. I’ve seen pedestrians stop in front of MDC’s windows, visibly pondering the meaning of the above statement. This sentiment undergirds our work; despite tried and true examples of trickle-up gain resulting from initially targeted policies, the idea that “society benefits when everyone succeeds” can seem abstract at best and untrue at worst. A scarcity mentality tempts us to dismiss collective benefit and cling to the belief that for one group to succeed, to matter, and to be recognized means that another group loses something. So what does MDC’s mantra, the antithesis of scarcity, really mean, and how do we know it’s true? This past Sunday night, a 98-year-old African-American woman appeared on stage at one of the most prestigious awards ceremonies our nation celebrates. She was greeted by a standing ovation as the crowd of stars gathered for the 89th Academy Awards cheered her legacy, the inspiration for one of the year’s highest grossing films. 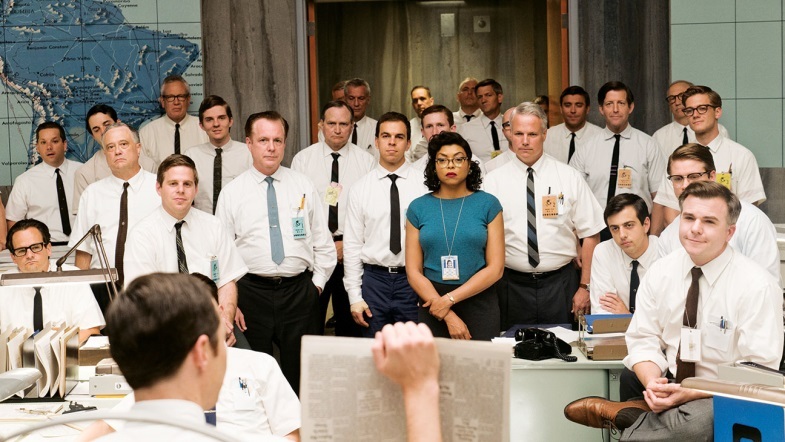 But Katherine Johnson’s achievements are far more profound than the narrative of a blockbuster. Looking out at a sea of glamor and elitism, Katherine Johnson proudly exemplified why success and opportunity are not a zero-sum game. Except: yes, they do, and no, they can’t. Mary Jackson notices a defect of the heat shield surrounding the capsule that will carry John Glenn into space. But without the credentials offered by the whites-only school in Hampton, V.A., Jackson is barred from contributing her talent. Engineering in Virginia, therefore, is structurally maintained as a white field, for white talent. The American people are eagerly awaiting Glenn’s journey to space; little do they know the progress of U.S. space advancement is tied to the progress of integrating their schools—a measure met with opposition from large segments of the Southern white population. Jackson petitions the city of Hampton to allow her entry to the all-white school and breaks the barrier that had been erected to keep people of color from accessing opportunity and actualizing their talent. What is seen by opponents of integration as an advantage for people of color and a loss for white students and families is, actually, a gain for the entire nation. Dorothy Vaughn similarly asserts herself in NASA’s work to accelerate progress in space travel. 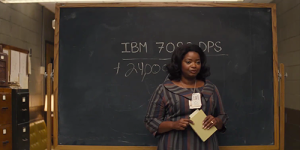 With the arrival of the IBM 7090, a machine that can rapidly compute calculations, Vaughn realizes that the new IBM could displace the black female computers she unofficially oversees. She throws herself into learning about the machine to ensure a place for her talent in the transition to using the IBM. But of course, the literature that would help her learn about the machine is in the whites-only section of the library. In the film, Vaughn’s character “bends” the rules by taking the book from the library, even though it is not approved reading for African Americans. From this book, she teaches not only herself, but also her all-black team of female mathematicians. By educating herself, which required covert studying and disobeying Jim Crow laws, Vaughn becomes the first person to successfully operate the IBM—something that made everyone’s work easier, more efficient, and ultimately made the U.S. more competitive. Finally, Hidden Figures tells the story of Katherine Johnson, who faces discouraging messages and procedures at every turn. She’s needed on the Space Task Group to calculate high-level equations to ensure Glenn’s safe orbit—the first black female to serve on the prestigious team—but she’s resented by her white counterparts. Her colleagues undermine her abilities and her contributions—everything from installing a “colored” coffee maker and excluding her from critical meetings. When Katherine spends critical work time walking miles to the “colored” bathroom, when she’s given partial information because she’s not deemed trustworthy, the nation falls further behind in the Space Race. But when segregation of facilities is no longer enforced and Katherine demands and is provided a seat at the table during top-secret meetings and knowledge-sharing, only then does the U.S. emerge victorious in sending the first American into orbit. Our whole nation benefited when Katherine succeeded, and she had the opportunity to fully contribute her talents only when intentionally exclusive, white-supremacist barriers came toppling down. Jackson, Vaughn, and Johnson’s stories teach us about the collective cost and unnecessary drain caused by Jim Crow policies in the South, as well as raise the question of why so many defended these policies in the first place. In hindsight, it seems obvious that structural and micro-level racial discriminations divided critical talent and held the whole country back. Stories like this always cause me to think: What kinds of harmful inequities will seem obvious to us fifty years from now? 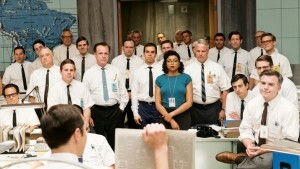 Instead of experiencing this history lesson and blockbuster film as a voyeuristic trip to the past, Americans can use the insights gained from Hidden Figures to sharpen our understanding of current barriers to opportunity—and consider what we all might be losing in defense of policies and structural practices that make it harder for those suppressed by disadvantage to maximize their full potential. And surely there is much unsupported talent trapped in the lowest income quintile, particularly here in the American South, where a child born to parents with earnings at the bottom of the rung has only a 0-6.4 percent chance of entering a career with earnings in the top income quintile as an adult. The researchers who unearthed these alarming data found that this stalled mobility was associated with lower quality schools, high rates of racial residential segregation, lack of connection to social capital, lack of two-earner households, and high rates of income inequality. These factors exacerbate one another: income inequality combined with racial residential segregation creates inequitable quality of schools, negatively affecting students of color at a disproportionate rate, given local school funding formulas that often rely on property taxes. These economic mobility toxins plague the South at a higher rate than any other region in the U.S.—the same region, of course, that clung to racial segregation and Jim Crow legal discrimination for so many years. These exclusive policies were designed to bar people of color from accessing the same degree of opportunity and success as the white population, and the data show us that historical educational and economic suppression carry long-lasting symptoms that have intergenerational effects on families and entire communities. Quality STEM Jobs: Who Is Getting Them? We’ve got some STEMpathy if you’re kind of over stories about science, technology, engineering, and math (STEM) jobs, and the education and training required to get them. But there’s a good reason for all (or at least most) of those stories: employment in STEM occupations tends to be higher-wage and higher-growth than other occupations. With startlingly low economic mobility for young people in the South, STEM jobs could provide new pathways into stable careers. Like many high-tech locales, Huntsville owes its 21st century economy to an initial burst of funding for government research. It was a town of 16,000 residents working in cotton mills and on watercress farms when, in 1950, the U.S. Army relocated a team of rocket scientists to Redstone Arsenal, a local installation that produced chemical munitions during World War II. In the decades that followed, NASA designed, assembled, and tested the rockets that put the first men on the moon. Boeing, Lockheed Martin, and dozens of lesser-known aerospace and defense companies have swarmed to Huntsville. 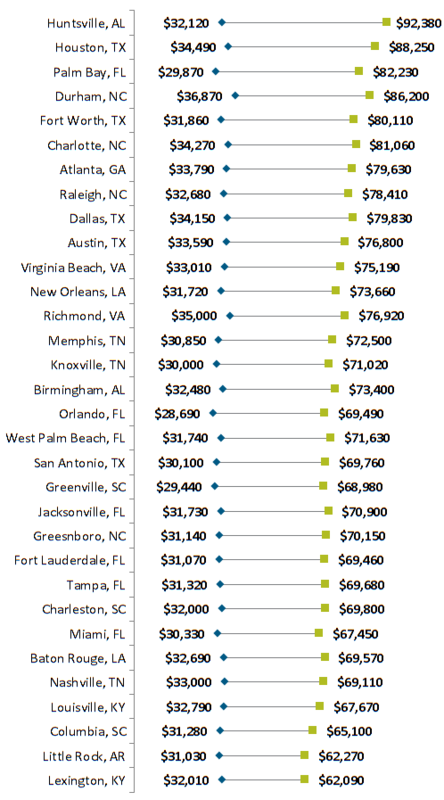 Durham, N.C., has a STEM labor force that’s 13.9 percent of all workers. Its biotech economy started with a sprawling research park that began to grow around the same time that Huntsville’s high-tech transformation was getting started. The Bloomberg author notes that these jobs pay good salaries and those salaries support other draws—like good public schools, restaurants, and arts and entertainment that make the communities appealing to potential employers and potential workers. Job growth doesn’t happen automatically, and it’s happening less and less through traditional industrial recruitment. 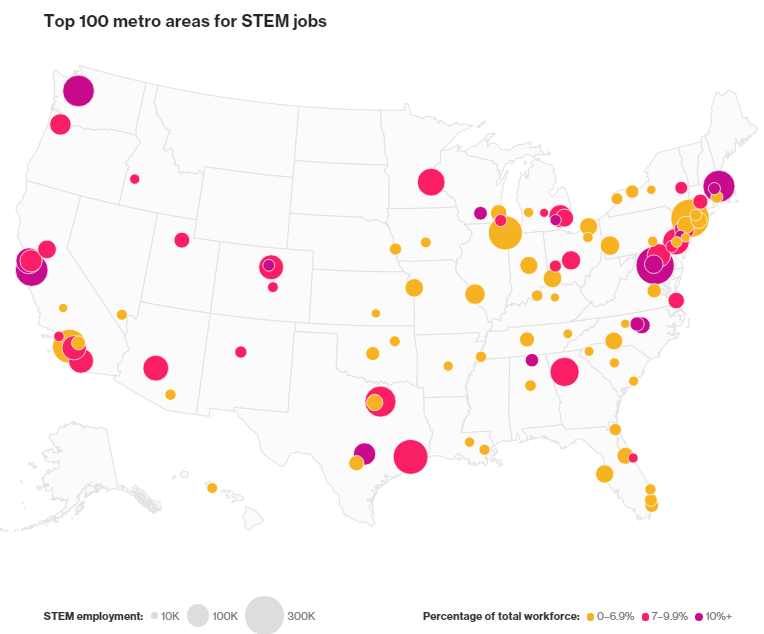 STEM jobs are growing in the places where there’s been investment in the services, amenities, and institutions that support those sectors, and particularly in places with a highly educated workforce or the ability to attract one. 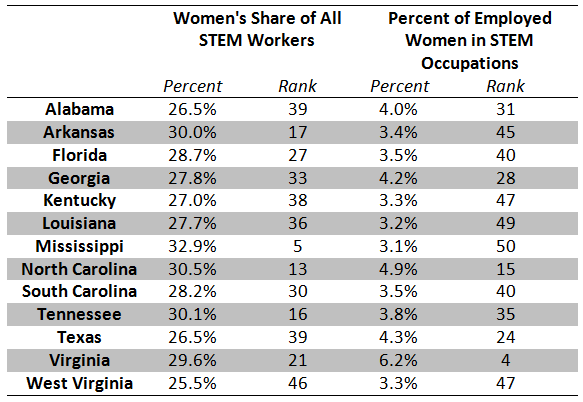 Southern cities that are seeking to take advantage of STEM job growth must make sure that the pathways into those jobs are strong and equitable. We have to consider what barriers, both real and perceived, are preventing women and people of color from pursuing those careers in greater numbers. 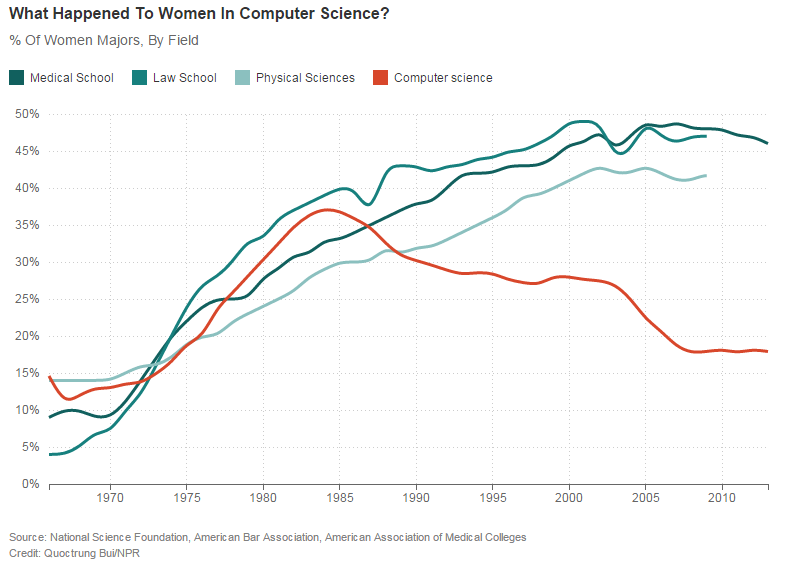 Though these data show a significant gender gap, community colleges are an important part of the pathway to STEM careers for both women and men, as detailed in an article this week by Lane Florsheim in Marie Claire magazine. More than half of people who receive bachelor’s degrees or higher in a STEM field completed some of their coursework at a community college, including 55 percent of women (63 percent of women with young children) and 44 percent of men. … a recent study by two Iowa State University researchers found that women at community colleges reported a friendlier atmosphere in STEM-related classes than at four-year colleges. “It is just such a global community,” one student said of her community college experience. The researchers found that similarity in backgrounds and lifestyles made women feel more comfortable stepping into leadership roles in activities and assignments. Strong advising and support from faculty also marked a major difference. Since so many students transfer out, they often work closely with guidance counselors to develop transfer plans. “The two-year plan keeps me focused, and saved me with financial aid,” another woman said. Stereotyped messages about who “belongs” in a field matter to young people who are trying to envision themselves in careers. Holding that vision is difficult to do while women in corporate leadership, especially tech corporate leadership, are few and far between. Only 5 percent of Fortune 500 companies have female CEOs (women make up 15 percent of C-level executives and 17 percent of board members, even though research shows that boards with women tend to outperform board without women). A TechCrunch analysis of 84 “unicorn” companies, or U.S. software or internet-oriented companies that are backed by venture capital and valued at more than $1 billion, found that only two CEOs are women, 30 percent have no women in senior leadership, and approximately 70 percent do not have women on their boards. And a Fortune analysis of 191 major U.S. venture capital firms—the crucial backers of tech innovation—found that only 5.6 percent of decision-makers and 10 percent of all investment professionals were women. The power of these stereotypes is seen in a study of academia that found fields that prioritize brilliance and raw talent tend to have lots of white men in them, while fields that emphasize the importance of hard work tend to have larger percentages of women and people of color. Unconscious bias influences who we think of as brilliant and talented—if you don’t look like the typical applicant, then the employer may not be as able to see your unique talent. 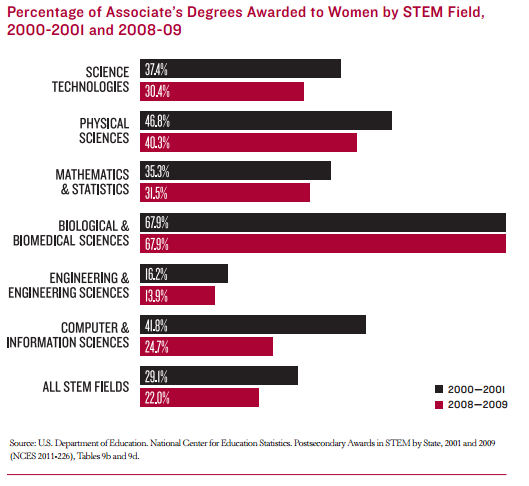 Women make up 20 percent or less of PhDs in physics, engineering, and computer science; it’s understandable that young women may not see STEM fields as welcoming for either education or employment. For the Southern economy to thrive, our workforce needs the skills to compete in the global economy and emerging fields—and we need those skills be to accessible to a broad range of workers, including women and people of color. STEM skills will often be highly technical and specialized, requiring both postsecondary training and job-based experience. Developing equitable education and hiring systems can help us shift patterns of economic mobility and ensure that more Southerners can connect to living-wage careers. We know who runs the world, but that doesn’t often translate into equal pay and formal power. Southern women’s economic standing varies, of course, by geography, occupation, race and ethnicity, and educational attainment level. Overall, the South has lower economic mobility and economic security than the rest of the nation, and women in many Southern states are more likely to be struggling economically than men. the share of women working in managerial and professional jobs.